King Kong is back and we finally get our first look at the biggest King Kong ever (besides the stupid movies that no one watches anymore). This King Kong is supposed to be way bigger than the last major film version and you can certainly see some of that here in this exclusive King Kong photo from Entertainment Weekly (the God’s of exclusive movie photos). The last King Kong movie was pretty damn awesome and extreme, so it makes sense that the director of this film decided to go back to the 1933 versions of Kong for his monstrous size. We sort of went back to the 1933 version in the sense that he’s a bipedal creature that walks in an upright position, as opposed to the anthropomorphic, anatomically correct silverback gorilla that walks on all fours. Our Kong was intended to say, like, this isn’t just a big gorilla or a big monkey. This is something that is its own species. 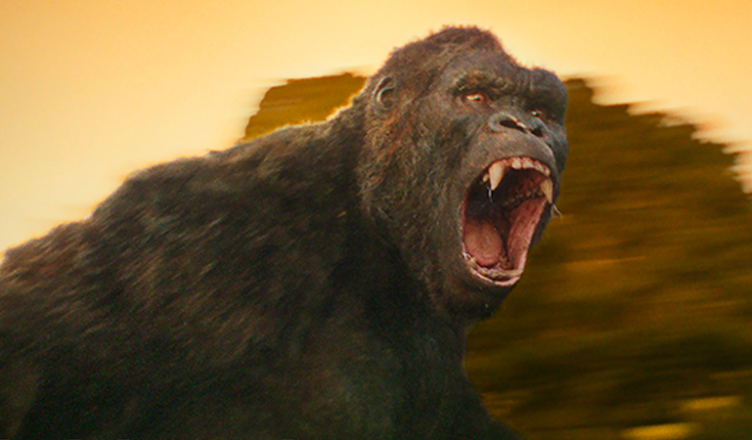 It has its own set of rules, so we can do what we want and we really wanted to pay homage to what came before…and yet do something completely different.While still are waiting for the second official trailer for King Kong: Skull Island, we did get blessed with some extra footage in a brand new international one. Kong: Skull Island stars Tom Hiddleston, Samuel L. Jackson, Brie Larson and others as it hits theaters March 10th, 2017!